MORE Animal Testing? Are You KIDDING ME? 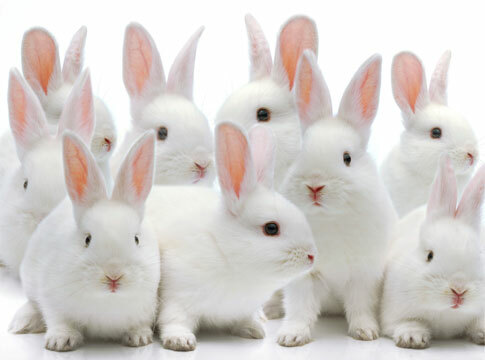 Recently I told you about the dirty little secret that is testing cosmetic products on animals. This week I learned that the UK has increased its’ testing on animals by 52% from the year 2000. Listen, you humans, there is ONLY ONE WAY to stop this. And that’s when you STOP buying products that are testing on animals. Oh, I know, you want to have soft skin. Just remember next time you smooth that fancy lotion on your legs that it was first rubbed in the eyes of a rabbit. Yeah, good luck getting THAT image out of your head. So, ready to change your ways? To be a shopper of conscience, you have to be savvy. Just because a product’s label says “cruelty-free,” it doesn’t necessarily mean the product wasn’t tested on animals, at least in the US. There is no legal definition of the term, so companies can say a product is cruelty-free if the final product wasn’t testing on animals, but there was testing done on individual ingredients or during product development. That’s why you want to ensure products you use include the Leaping Bunny logo. 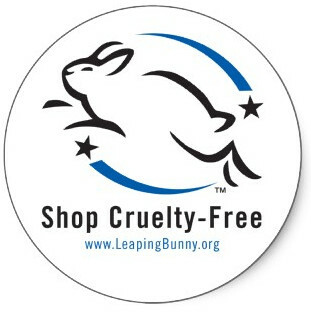 The Leaping Bunny logo means the company has agreed to open their records up to Leaping Bunny at any time to verify there’s no animal products or testing used. 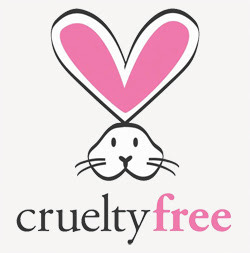 Alternately, The Caring Consumer logo means the company has agreed with PETA to not use animal products or animal testing in its products. However, there’s no regulation to ensure that’s the case. So get out your reading glasses and start looking for those cute little symbols on the products you buy. Or you can download the Leaping Bunny app for iPhone or Android and shop with confidence! Please do your part to end this barbaric practice of animal testing today! That makes me so sad… think it’s a no-go that animals have to pay only because we want pink lips or smokey eyes :o( I always have the list in my bag and I only buy things what are not tested on animals. Yay! Let’s challenge others to do the same! BUT…it’s not all a terrible thing. Certain ingredients used in cosmetics used to cause blindness. Allergies are frequent causing rampant skin irritations. It’s not just to be cruel that there is animal testing. That may be, but to inflict misery on an animal so you can buy a product solely for vanity is, at least in my book, unconscionable. I agree. This is not like they are on a quest to find a cure for cancer. (Which I personally think should be experimented on prisoners) but just so we can have a pretty face. Who honestly thinks that’s okay?! I don’t want a bunny being stabbed or poked in the eye repeatedly to see if irritation from a mascara is going to occur. That’s just insanity! There’s no need for cosmetic testing to occur on animals at all! Thanks for the clarity on this topic– I will certainly check labels more carefully now! Yeah, passing laws always results in a loophole a mile wide. Power of the purse is FAR more effective. Where’s the “don’t like” button. And that’d be euphemistic! Voted again today. I hope you win. Thanks for the vote! And I don’t like it either. Increased?? WOW! Thats a huge step in the wrong direction! Glad you’re helping to get the word out. It is so frustrating to me (as a person, and as a cruelty free blogger)!! I really hate that we still have to look out for this stuff. I don’t understand why people think it’s okay. I think they don’t think about it at all. I didn’t know this was happening in the UK, I’m flabbergasted; I thought testing on animals was reducing, not increasing, and that’s unacceptable. I haven’t seen these labels on any products, so I will have to scrutinize them more closely to make a choice. Making labels more visible would help consumers in their choice, but the most effective way to make these companies sit up and take notice is to hit them where it hurts – in the pocket. If we don’t buy their products, they will have no business. Thanks for bringing this to our attention, we can help by spreading the news. Mom doesn’t wear war paint. She always checks labels to make sure that things are not tested on animals. Thank you for everything that you do. I agree, but we won’t change anything if we allow our sadness to keep us from trying. It’s terrible…but it’s only an extension of what humans do all the time. I don’t think that the human-race will ever be civilized enough to stop torturing and killing – they’ve done for centuries, they’ve done it in the name of religion and culture, and now they also do it in the name of science. We should be thankful that there still are a few who believe in equal rights for everyone who inhabits this planet. Thanks for posting this. And yet, we know through our studies of history that it IS possible to change the public consciousness. True, the voices of the nay-sayers may be louder and better-funded, i will still insist on raising mine to the extent that I can, and encourage you to do the same. All animal research in the UK is for medical, scientific, veterinary or environmental purposes. Cosmetic testing, and testing of cosmetic ingredients is illegal in the UK, and has been for almost 15 years. The leaping bunny logo is essentially meaningless here. Thanks for the info! I wouldn’t have considered that an animal still could have been tested on even though it says cruelty free. This is so heartbreaking, but thanks for the info. on the cute little symbols. Now I know and can be looking for those when I shop. Yep mommy nevew uses anyfin’ dat’s been tested on animals. Hers sez is wong, but also that she didn’t come fwum no animal and so what ifin is safe fur a bunny or monkey or kitty or daggy. That dusn’t mean is safe or will work fur hers. And hers can’t magine usin’ sumfin’ that has animal pawts in it. Hers sez dat da animal pawts beong on/in da anmal not hers. 🙂 Gweat posty.